(6 June 2018) An international workshop at UNICEF Innocenti will bring together and foster exchange between researchers and policy makers working on social protection in settings of humanitarian emergency. The workshop, jointly organized with UNICEF's Social Inclusion section in New York, will take place on 7 and 8 June. The workshop is seen as a follow-up to the international conference on social protection in contexts of fragility and forced displacement held in Brussels in late 2017. Impacts of programs targeted at refugees and host communities. All seven papers are now available for download and can be found on the right-hand column of this page under "Related Content - Publications". 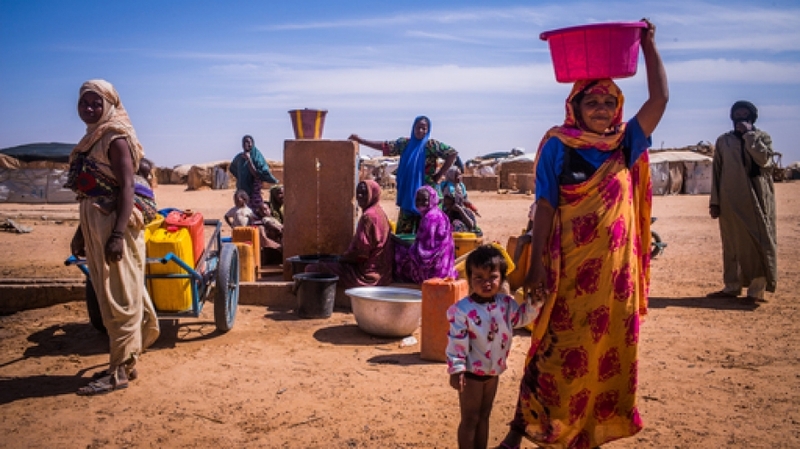 Malian refugees use a water point in the Mangaize refugee camp, Niger. Recurrent conflict between armed groups in Northern Mali cause a constant influx of refugees into the Tillabery and Tahoua regions of Niger. As part of the commitments under Sustainable Development Goal (SDG) 1, the global community at the 2016 World Humanitarian Summit (WHS) pledged to expand the coverage of social protection measures for all, and to achieve substantial coverage of the poor and the vulnerable by 2030. This expansion must include scale up of social protection in humanitarian contexts, including fragility and forced displacement to ensure no one is left behind. Social protection is increasingly considered as an important policy response in contexts of fragility and displacement. In non-fragile contexts, Innocenti research has provided extensive evidence and knowledge on related policy implications generated by Social Cash Transfer Programmes in several low and middle income countries, including Kenya, Tanzania, Malawi, Zambia among others. Between 2013 and 2015 positive impacts on poverty, income multipliers, food security, productivity, education and health demonstrate that social protection helps reduce poverty, inequality, enhances livelihoods, and has long-term positive impacts on human capital development. This year the UNICEF Innocenti team will continue to document positive evidence and knowledge gaps associated with conducting research on these systems, such as the cash transfer program in Lebanon, known as Min Ila, an initiative of the Government of Lebanon, UNICEF, and the World Food Programme to encourage school participation of displaced Syrian children. As Jacob De Hoop, Humanitarian Policy Specialist at Innocenti leading the research, highlights in his blog this research represents one of the first evaluations of a cash transfer program that aims to improve education outcomes for children in a refugee context and helps fill an important gap in our knowledge about what programs work to help refugees. It also demonstrates the challenges of achieving an equitable balance between assistance for refugees and host populations, an important question, particularly in locations where social protection guarantees for nationals and social services infrastructure remain limited. In September UNICEF Innocenti interviewed six experts attending the Brussels Conference to talk about existing challenges, experience and potential of social protection programmes in contexts of fragility; forced displacement and prolonged crisis, as well as to identify future directions for research. Their words confirm the lack of knowledge in those areas and the critical role of research in bridging the gaps. The interviews conducted now form the basis of a new edition of UNICEF Innocenti's Research Watch programme titled: Social Protection in Emergency Situations Research Watch. On the Research Watch page you can find all the expert video interviews as well as extended podcasts and written commentary. You can download the seven working papers now! Search on the right-hand column of this article under "Related Content - Publications".